Align Yourself with Tom Hegna! 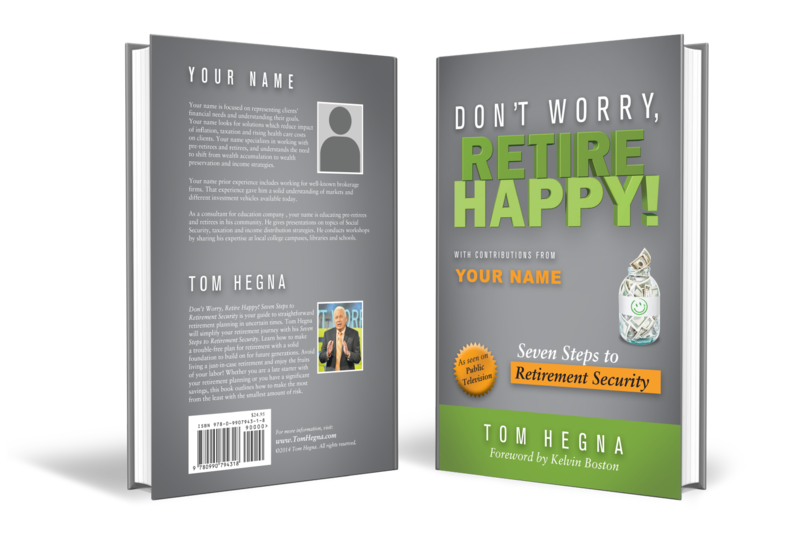 Align Yourself with Tom Hegna’s trusted brand by being a Contributor to his popular retirement planning books! Now being offered for Don’t Worry, Retire Happy! Seven Steps to Retirement Security and Paychecks and Playchecks: Retirement Solutions for Life. Being a Contributor to these books can be a great way to educate your clients about the math and science of an optimal retirement plan. Every Custom Book comes with your name directly on the front cover. Your name, headshot, company logo, and personal bio is presented on the back cover. On top of that, you get your headshot, company logo, company's contact information, and company bio exclusively on the front cover flap. Say Cheese! Send a High Resolution Photo to Support@tomhegna.com - You may use an image of yourself, an image of your firm’s logo, or both. Images mustbe no less than 300 dpi (high resolution). Accepted file formats include: .JPEG,.TIF, .PSD, .EPS, and .AI. Photographs should have a minimum width of 2.25in and height of 3in. Logos should have a minimum width of 2in and height of 1in. Write a powerful 100 word biography for the back cover of the dust jacket. This is the ideal place to provide a biography about you and maybe your practice! Make sure to check your grammar before submitting! Submit 100 words to support@tomhegna.com. Write a 250-word description of your firm and details about what you can offer clients. You may wish to use this space for additional information on your firm, your services and products, your approach, etc. This text will appear on the inside of the dust jacket flap. Make sure to check your grammar before submitting! Submit 250 words to support@tomhegna.com. Once our team has received the items from Step 2, 3, and 4, our graphic designers will start putting together a book cover layout for you to review! This process typically takes 7-10 business days to complete. Upon receipt of the documents, our team will reach out to you to provide a specific timeline. Once completed, our graphic design team will send you a digital proof for your review. Review Your Proof! You will have the opportunity to submit 1 round of edits for your proof. Please make specific instructions for our graphic design team so they can make the appropriate changes as requested. Included in the cost is 1 round of edits to the document. Each additional requests for edits will be billed $50 per round. Final Sign Off and Print! – Once we receive final approval for our proof, we require a 50% deposit for your purchase. Please contact our team using the live chat to process payment for the deposit. Upon receipt of the deposit, our team will get the customized jacket off to the printed from our preferred vendor. This step in the process typically takes 10-12 business days. During this time, provide your shipping address to Support@tomhegna.com to obtain an estimated shipping quote. 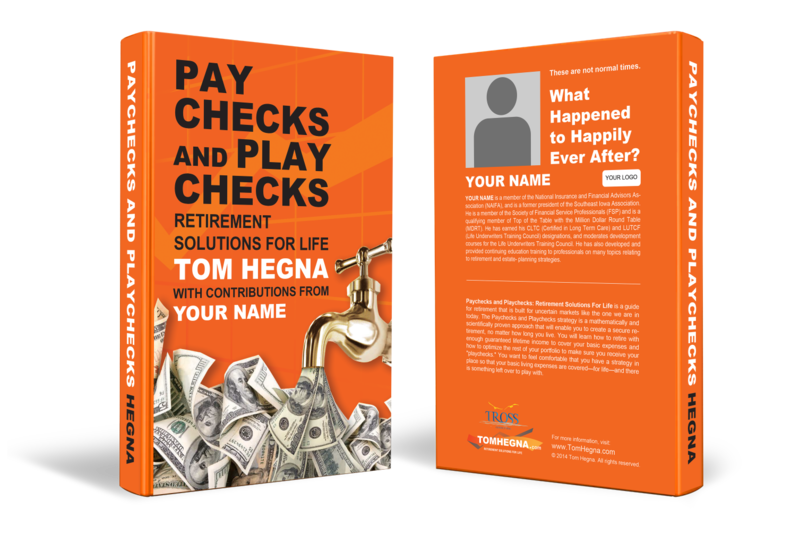 Start Educating Your Clients with your customized Tom Hegna book! Get the books in the hands of your top clients, prospects and referrals!